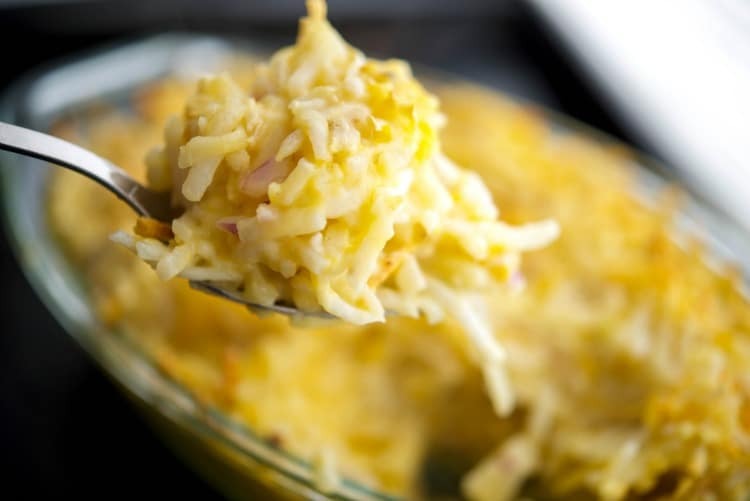 Learn how to make Cracker Barrel’s Hashbrown Casserole at home with five simple ingredients. Perfect for breakfast or a weeknight side dish! The closet Cracker Barrel to my home is about 45 minutes away so we don’t eat there very often; however, when we drive to FL or PA while visiting our daughter in college we generally stop there for breakfast. Their Hashbrown Casserole is one of the only things I order off of their entire menu because I always thought it wasn’t something I could replicate at home. Thank goodness I found a recipe that is spot on that I can now make at home. On most Sunday mornings we have what we like to call a “big breakfast”; which generally means I’ll make eggs, bacon, and some sort of potato. My favorite is potatoes with chorizo and onions, but I haven’t found a good chorizo here in NJ in quite some time so it’s been on the back burner until I get some from our favorite store in Fall River, MA; so I decided to experiment with one of my favorite breakfast hashbrown casseroles instead. 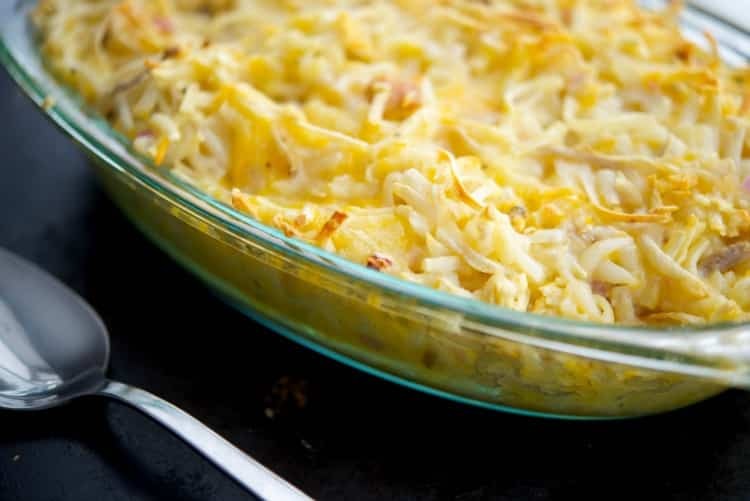 There are only five ingredients in this casserole including frozen shredded potatoes, butter, onion, cream of chicken soup and shredded Colby Jack cheese. The entire recipe takes less than 10 minutes to put together because you can just combine everything together in a bowl, add it to a casserole dish and then bake it for 20 minutes. 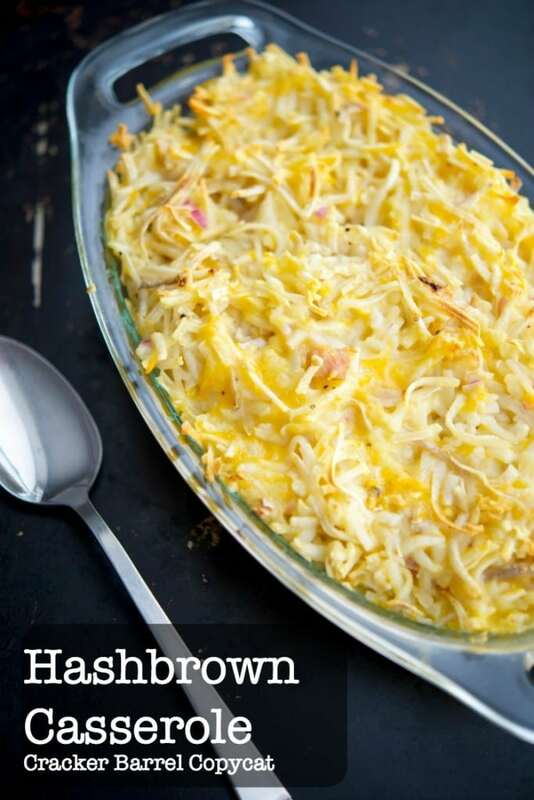 In 30 minutes, you can make this favorite restaurant copycat recipe for Hashbrown Casserole at home. It’s deliciously cheesy and perfect for Sunday breakfast or as a side dish to accompany your main dinner entree. My family LOVED this recipe and can’t wait for me to make it again. Next time, I think I’ll try it with fat free soup and cheese to reduce some of the calories and fat. ~Enjoy! 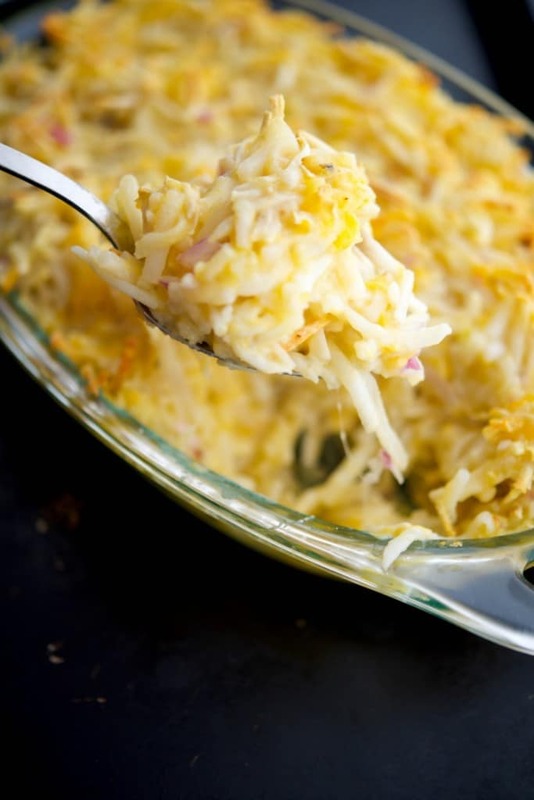 Learn how to make Cracker Barrel's Hashbrown Casserole at home with five simple ingredients. Saute onions in the butter in a small pan over medium heat until they start to soften; approximately 1-2 minutes. Combine the potatoes, onions, soup and half of the cheese in a bowl and mix well. 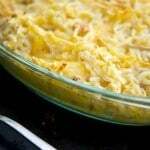 Place in a small casserole dish; then top with the remaining cheese and bake for 20 minutes until hot and bubbly. What is your favorite breakfast casserole? I plan to make this for our church’s Easter breakfast after sunrise service. Is it OK to double this recipe? Will it fit in a 13×9 baking dish? It’s ok to double the recipe and should fit in a 13 x 9 dish. I used a 2 qt casserole dish when I made this recipe so that size should be fine. Enjoy and Happy Easter! Thanks for this recipe! Sounds so easy to make and yummy; will work great when my family comes to visit. Will give me extra time to visit and cook other things to go with this! Love all the recipes! Thanks Sherry, I hope you and your family enjoy the recipe!